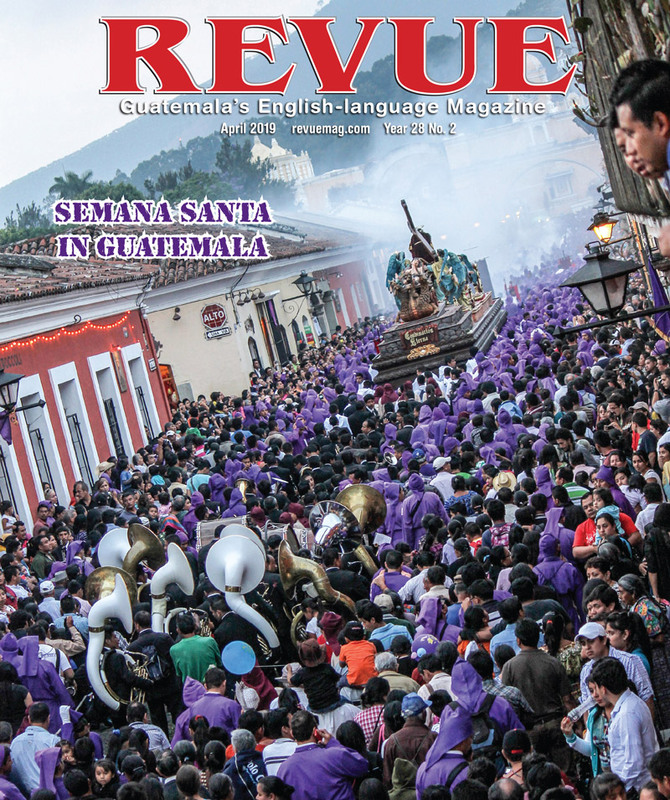 On November 1 and 2, a powerful force stirs in all the towns of Guatemala. Traditional markets are filled with flowers of sempa (orange marigolds), chrysanthemums, wild daisies and the smell of copal—a pre-Columbian incense made from pine resin. People clean family graves and adorn them with cut-out tissue paper called papel picado, wreaths of fresh flowers and candles. They also honor the dead with festive foods such as candied fruits, tamales and fiambre (a cold meat and vegetable dish prepared only at this time of year). These days mark the celebration of El día de los difuntos or the Day of the Dead, a very important festival throughout Guatemala, especially in the predominantly indigenous town of Santiago Sacatépequez, where it is the occasion for a unique kite-flying ritual of the Kakchiquel people, integrating the Catholic feast of All Saints with pre-Columbian Mayan practices of remembering the dead. The kites are made as a way to communicate with the dead, symbolically attracting the spirits to earth at this special time of the year, when family members, living and dead, are reunited. In Santiago Sacatepéquez, there are six cofradías (religious brotherhoods) dating from the 17th century, each dedicated to a different saint. Catholic missionaries instituted these brotherhoods to involve the laity in the spiritual life of the church. Indigenous populations, struggling to maintain their cultural traditions and languages, blended traditional Mayan practices with Christian rituals in the cofradías. It is the cofradías that organize and carry out all public religious celebrations. The leaders of the cofradías are called mayordomos. Villagers choose the lead or primer mayordomo for a one-year term during which he and his family must finance everything related to the feast day. The celebration of Day of the Dead takes a year to plan and involves not only religious obligations but also coordination with municipal services and local political leaders, bestowing on the cofradía a great deal of political and social clout. The more services the cofradía provides to the town, the more esteemed its leader. Over time, this practice creates a network of reciprocal obligations among town members. Different cofradías are in charge of organizing different religious celebrations. Preparations for the celebration begin 40 days before November 1, when young people begin the construction of the kites, a tradition dating back at least 109 years. Customarily, young men did most of the work, but today young women join them in selecting themes for the intricately designed kites, which may be political, religious or cultural. 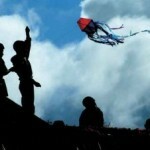 There is now a female kite-making contingency in Sacatepéquez that competes in the annual kite-making competitions. Before the kites can be made, the unmarried men of the village rise at 4 a.m. to travel to the coast to hunt for bamboo for the frames. In the eyes of the town, this pre-dawn journey marks young males’ passage from boys to men. The journey to the coast is difficult, and once the youths arrive, the work of cutting the thick bamboo is laborious. The youths return from the coast to find the townspeople waiting for them, eager to hear their stories of adventures on the coast. The bamboo is distributed to the kite-making groups to begin making frames, a process that continues every day until the Day of the Dead. Women’s role in the celebration has historically been less public than that of men, but crucial. They participate in the measurement, design and construction of the kites, preparing the ingredients and materials, as well as helping to decide on colors, designs and themes. Women also do the bulk of the festival food preparation, as well as the decorating of churches and public squares. All kite materials are natural. The glue is made from yucca flour mixed with pieces of lemon peel and water. Ropes used for kite strings are made from maguey, the plant from which tequila is extracted. Kite tails are made from woven cloth (to which people often attach hand-written messages to guide the spirits in their journey from heaven to earth). Woven stalks of castilla, a plant similar to wheat, form the frames of smaller kites, while the largest frames are made from the bamboo gathered on the coast. The kites display three main styles, each with a characteristic design and size, and are made of tissue paper, seemingly too thin to withstand the rough winds of the sky. “Crown” kites measure from three to five meters in diameter and have a circular frame around an empty center, like a donut. The inner and outer circles are connected with four bamboo stalks. “Diamond” kites range from a half to 10 meters in diameter and have a diamond-shaped frame, long tails and fly on strings of fishing line. 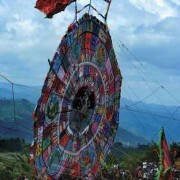 “Moon” kites are large circles of bamboo framing with a circular paper center and range from 10 to 15 meters in diameter. 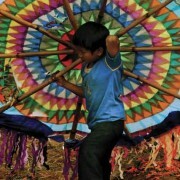 On the last Sunday in October, the people of Santiago choose their favorite kite, usually showing the greatest appreciation for intricately detailed kites with themes from ancestral Maya culture. On November 1, people begin to fill the cemetery at 4 a.m. While cleaning, repainting and decorating their family tombs, neighbors fondly reminisce about the deceased and catch up on the latest news. Community bonds are renewed and strengthened as people work side by side, sharing paint, tools and brushes to refurbish tombs, while they water flowers, pray and picnic together. The young people await a strong wind to raise their giant kites to the skies. 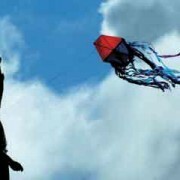 The kites brighten the skies and signal the traveling spirits until 4 p.m., when they are lowered and the townspeople return home to await the arrival of the souls. Families may set up home shrines or altars in honor of deceased family members, and extended family and neighbors visit each other to pay their respects. Visitors are offered boiled güisquiles (a vegetable which looks like an avocado and tastes like a potato), sweet corn, chilacayote (sweet squash) and jocotes (like a sweet olive), along with chicha, a hot fermented corn beverage that is indigenous to Mesoamerica. Eventually, the cofradía of St. Michael the Archangel leads a procession through the streets carrying an anda, or life-sized wooden statue of St. Michael. (Because this particular cofradia is in charge of organizing the town’s Day of the Dead celebration, they get to showcase their patron saint.) Members of the procession play the harp and accordion to the delight of the public. The townspeople travel with the procession from house to house throughout the night, sharing traditional foods and alcohol along the way. At 4 a.m. on November 2, everyone moves toward the cemetery with candles so the spirits can return to their celestial home. 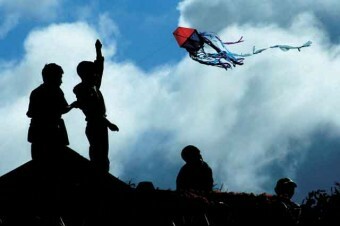 The townspeople raise the giant kites one final time to guide the spirits back to heaven. Later that evening, the kites that were torn by the winds are burned inside the cemetery, the smoke showing the way back to heaven for any vagabond spirits. 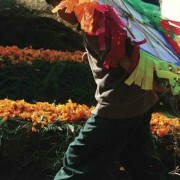 The surviving kites are exhibited in the local Catholic Church during a novena for the deceased, after that they are burned, and the ashes are buried in the cemetery, completing the annual ritual for the Day of the Dead in Santiago Sacatepéquez. Ignacio Ochoa, M.A., is the Academic Advisor for the Study Abroad Program at the Center for Latin American Studies of the Nahual Institute for Global Studies in San Diego, California. He holds MA degrees in Latin American Studies and Philosophy and has worked in indigenous, rural, and refugee communities in Panama, Colombia, Ecuador, Nicaragua, El Salvador, Mexico and Guatemala. Mr. Ochoa has taught at San Diego State University, the Harvard University School of Business, Northeastern University, and the Schools of Medicine and Public Health at San Carlos University in Guatemala. He was one of the judges for the Santiago Sacatepéquez kite competition from 2005-2007. 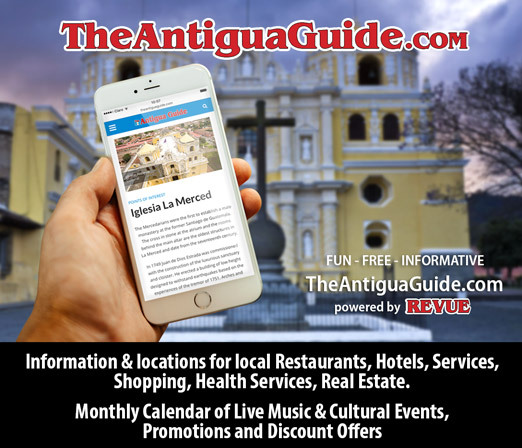 Editors note: See DateBook for more information about the Fundación Nahual’s October calendar that includes a kite exhibit, a kite-making workshop and several cultural excursions.